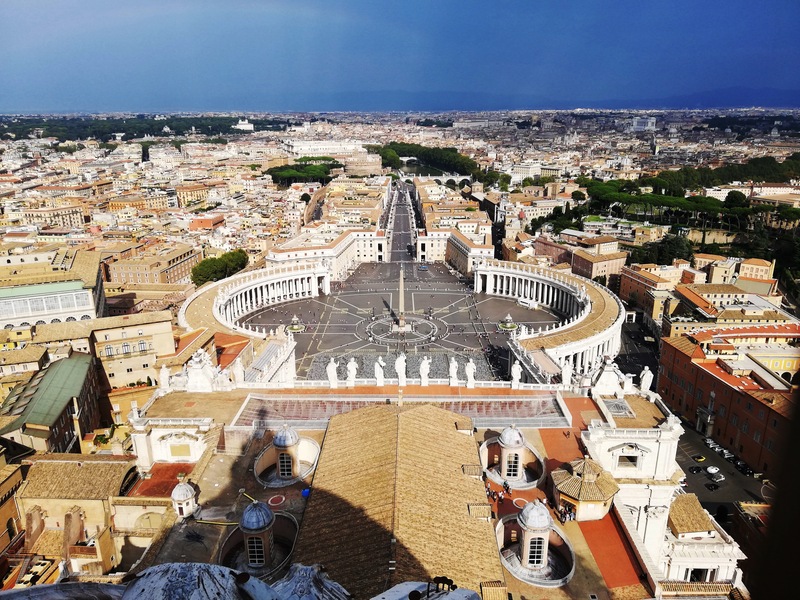 Everyone, who has visited Rome, knows St. Peter's square and St. Peter's basilica. 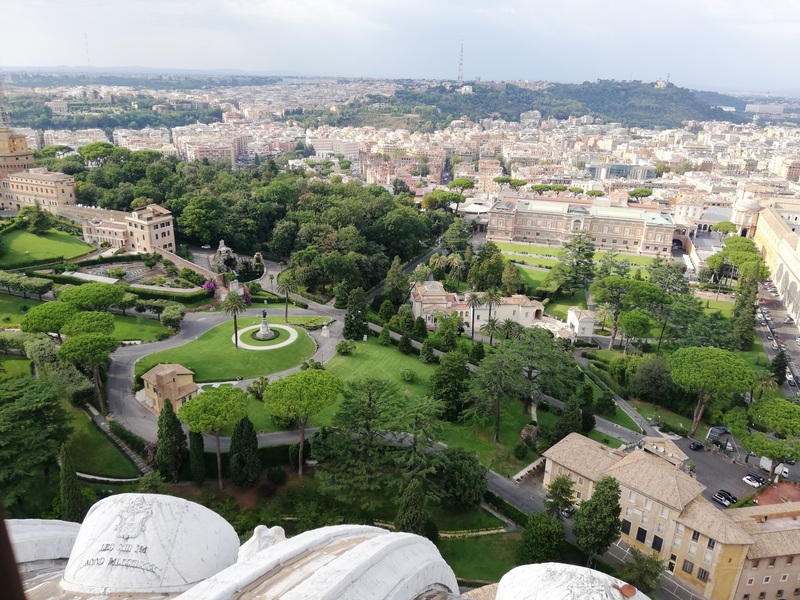 But did you know it's possible to climb up the St. Peter's cupole including its rooftop terrace and enjoy the breathtaking, spectacular panoramic view of the Vatican gardens & museums, St. Peter's square and a large part of Rome up to the Mediterranean Sea if weather is good? 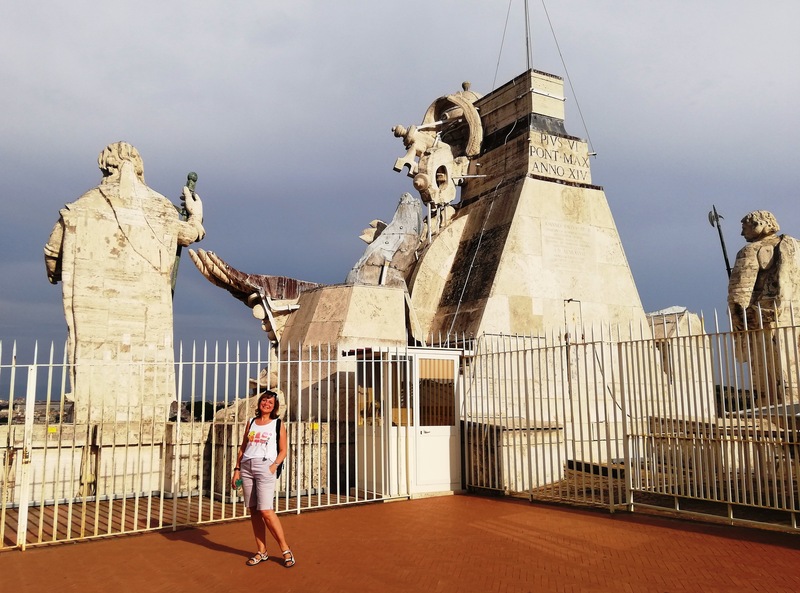 Although I've visited Rome many times, I've only discovered this opportunity recently and I would say it's simply the best experience which a traveller can bring from Rome. 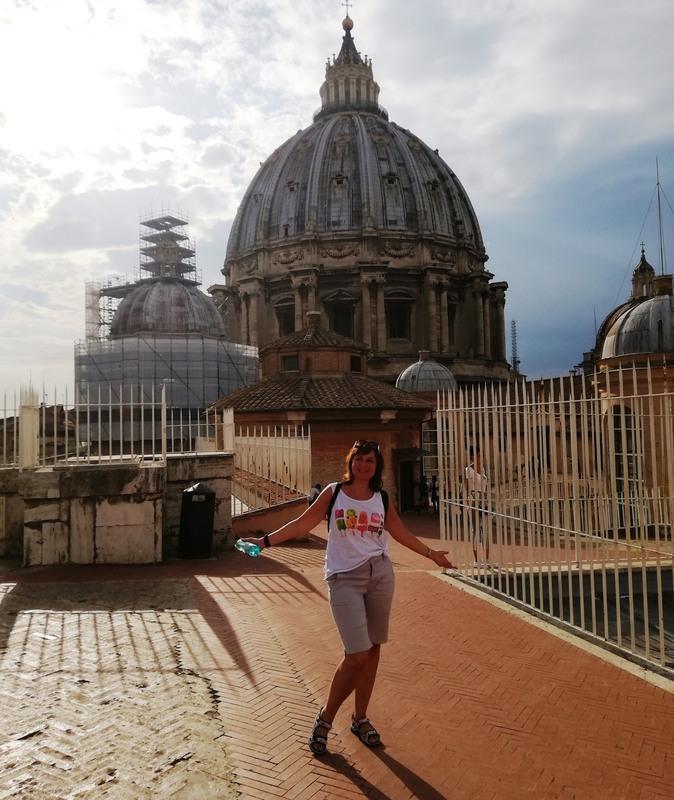 St. Peter's basilica is a major basilica in Vatican City, an enclave of Rome, one of the largest churches ever built and it remains one of the holiest places in Christendom. 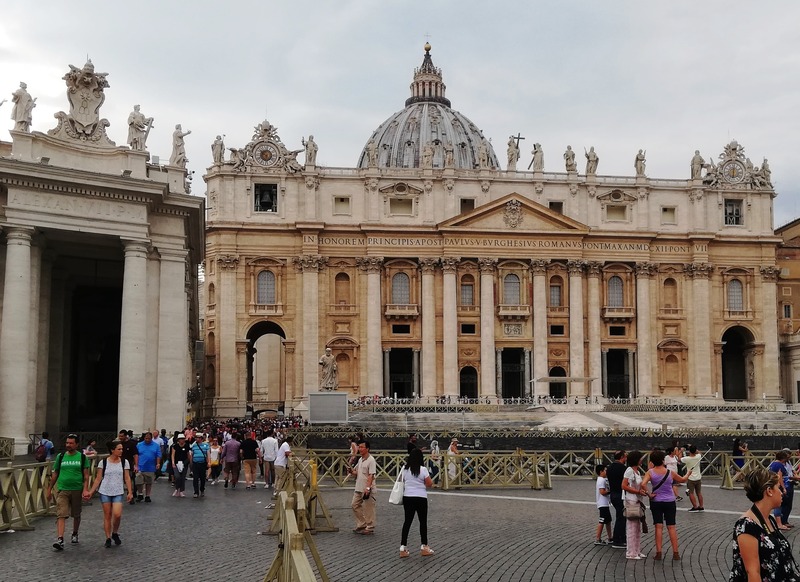 St. Peter's Basilica stands on the traditional site where Peter - the apostle who is considered the first pope - was crucified and buried. 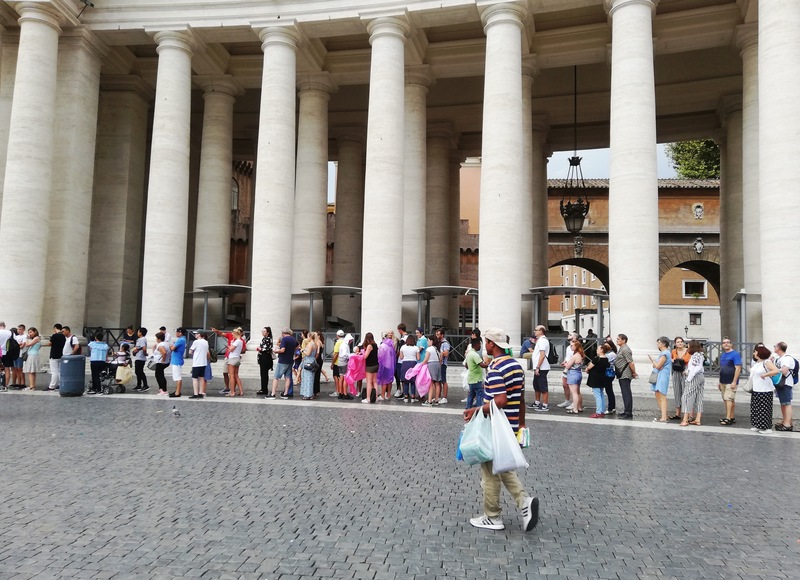 St. Peter's tomb is under the main altar and many other popes are buried in the basilica as well. Originally St. Peter's basilica was founded by Constantine in 324 and later rebuilt in Gothic style in a shape of an impregnable fortress. In the 13th and 14th centuries, during the Avignon captivity (when the Pope resided in France) no one cared about the building, so the basilica was dilapidated. 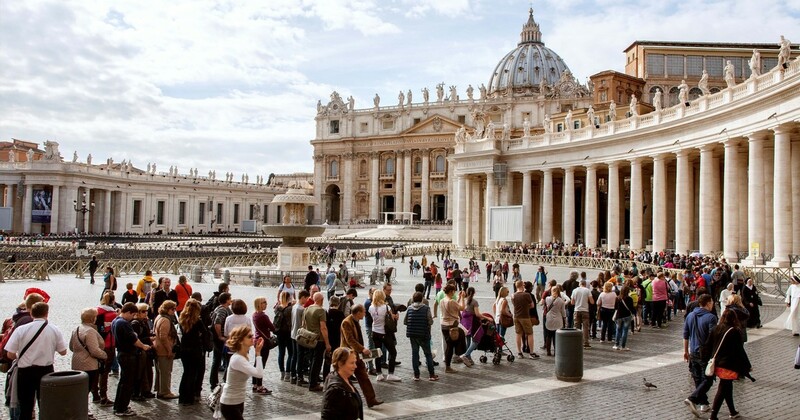 Thus, in 1451, Pope Nicholas I. issued a decree on the construction of a new St. Peter's cathedral. 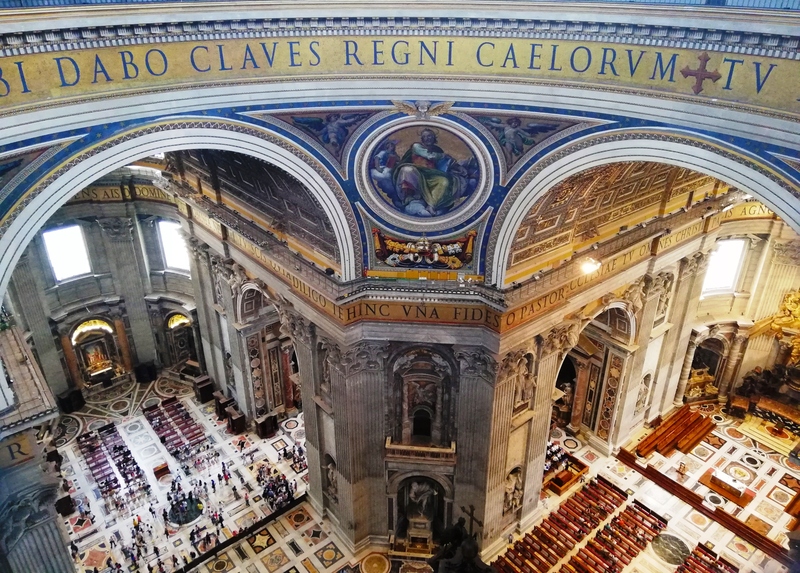 On April 18, 1506, the construction of St. Peter's Basilica began, and the foundation stone was laid by the Italian architect Donato Bramante. Many Roman architects, including Michelangelo Buonarroti and Gian Lorenzo Bernini were applying for this work, but the Bramante's proposal was chosen. 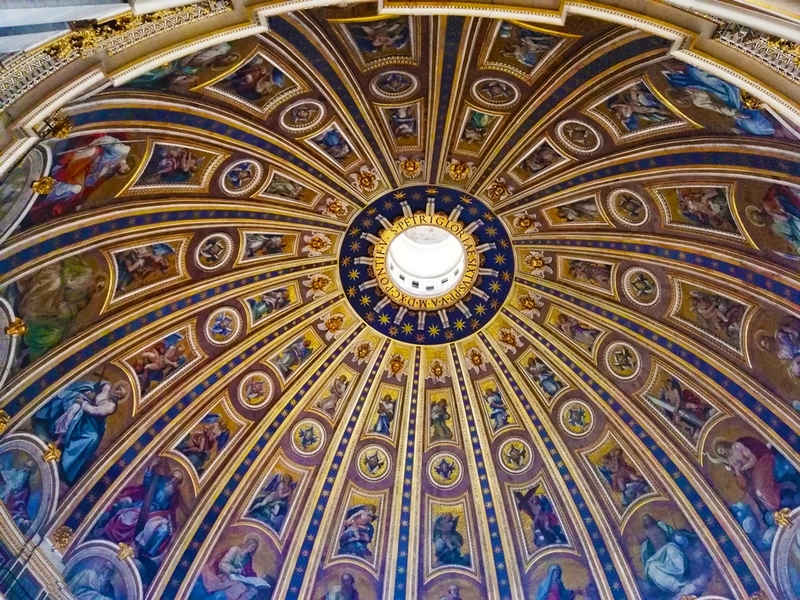 The basilica got the shape of a Greek cross with a central position of a large, impressive dome, surrounded by four smaller domes. 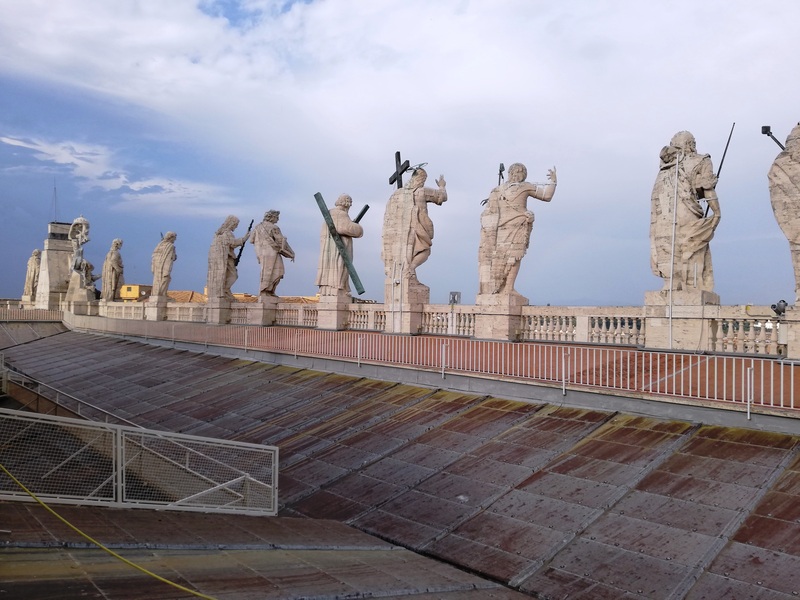 In 1547, the 72-year-old Michelangelo was finally assigned to lifetime master builder of the basilica. Paradoxically, a few years after his painting of the Sistine Chapel. 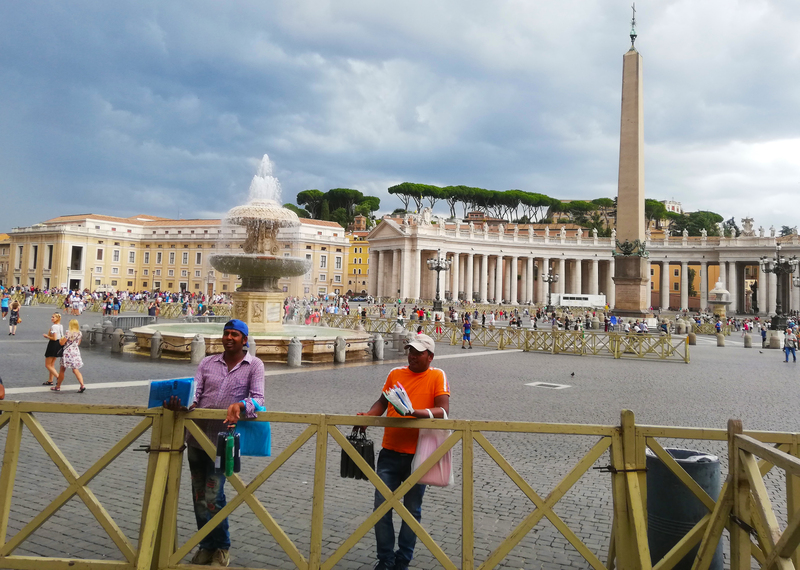 It is going to be rain...Street vendors selling umbrellas and raincoats on St. Peter's square in Vatican. The dome was inspired by the Brunelleschi Early Renaissance Cathedral in Florence and it's the tallest dome in the world. 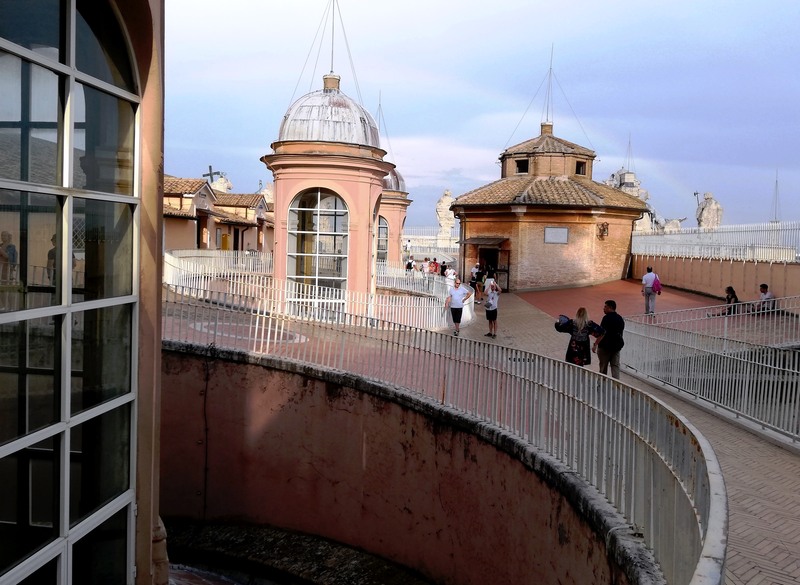 The elevator will take you to this 1st floor where you can enjoy the impressive top view to the San Peter's basilica. 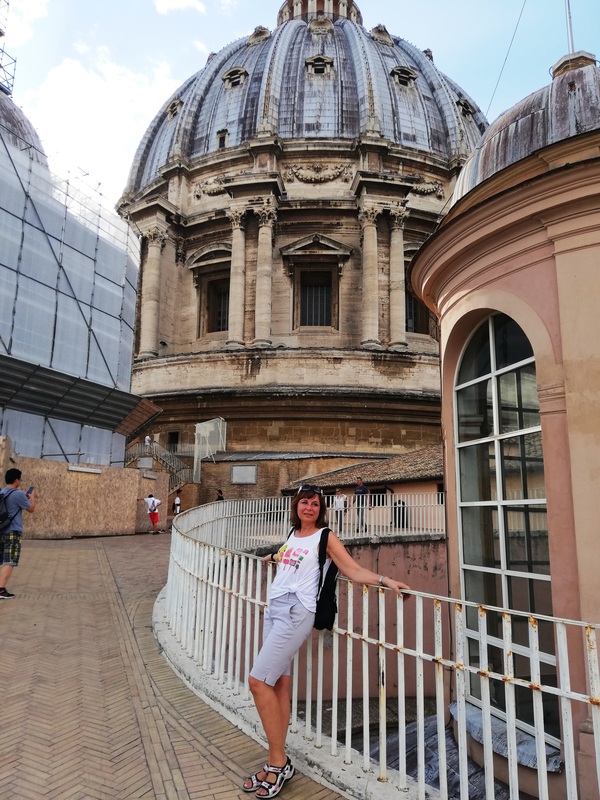 It's is an unforgettable experience to look out of the cupola, enjoy the view and on the way back to walk through the Cathedral's roof terrace. But climbing up it's a real challenge. The route up is demanding, unpleasant. There are things which visitors should know in advance. 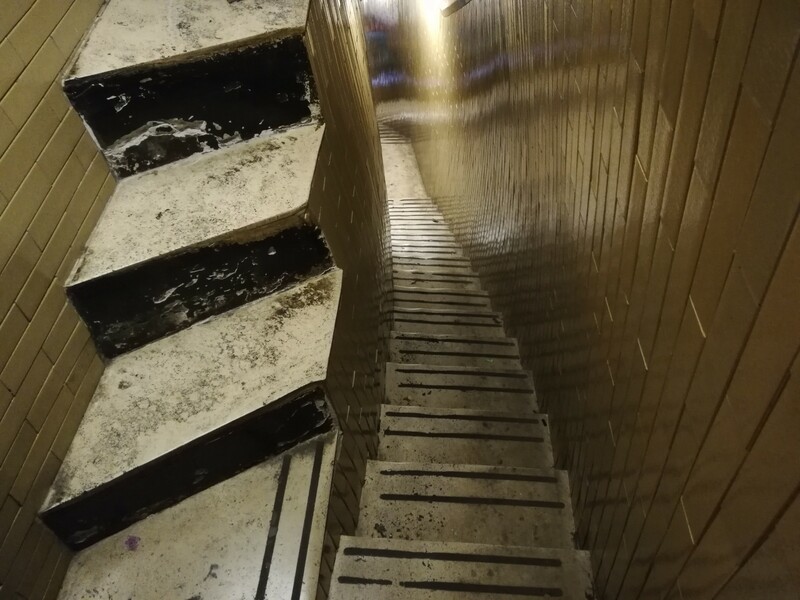 Cramped space without windows, hot and bad air on the staircase leading up to the copule. The narrow aisle inside of the copule. Just one-way! Go on. There is no way back. 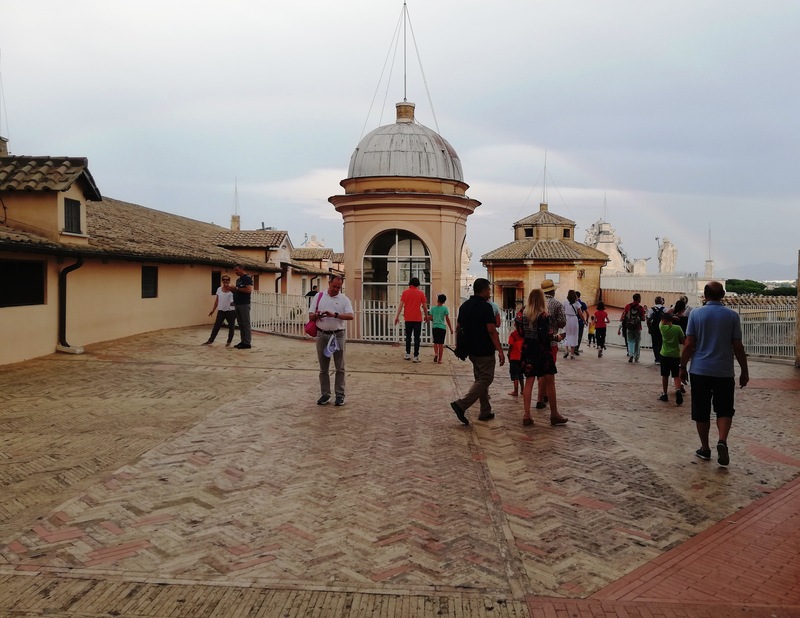 The floor is a bit crooked and sloped in some parts of the copule, without windows. Sensitive individuals can be sick. Just these spiral stairs and a few other types of staircases and you almost reached your target :-). 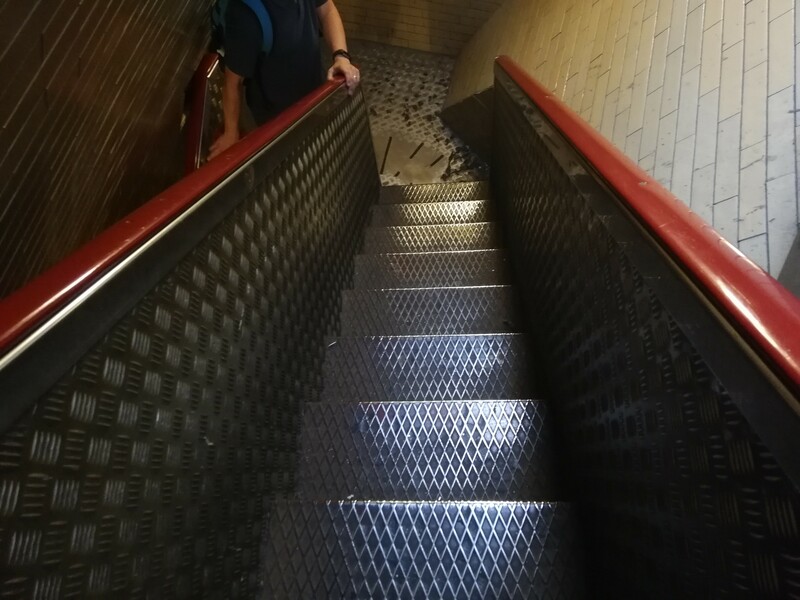 You can go upstairs without a lift for 7 EUR (551 steps in total) or you can go by lift for 10 EUR. But anyway, after leaving the lift you aren't at the top at all! You still have to climb about 400 steps. 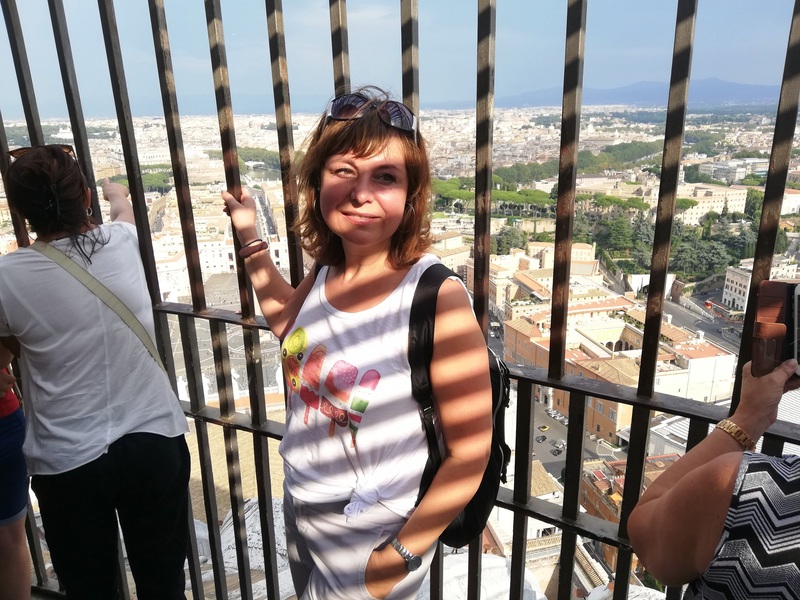 In the heat, with hundreds of uncomfortably crowded, dark, narrow (somewhere spiral) staircases and a rope to hold onto, this climb is just for those who are as curious as energetic and fit. There is just one-way route! 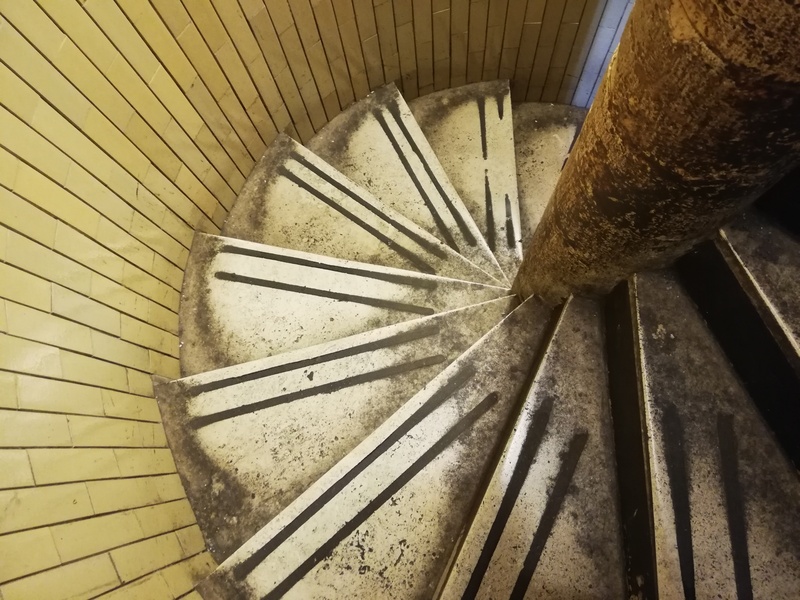 So when you decide to go up, then you have to continue and you can't go back. People with claustrophobia or motion sickness can have a serious problem, as well seniors or generally people who aren't in a good physical condition. Dress code: At the entrance they won't allow you to go there with naked arms and mini-skirts (a light scarf is good enough to put on your shoulders, inside you can remove it, no one checks it during your journey). And at the end: take enough water, good shoes and a good camera.